Guinness – a pint of the black stuff. So well known it’s even in the spell checker on my PC. And when you’re in Ireland, you can’t escape the stuff. It’s everywhere. And in Dublin is its home; the place from where a global empire began. Its brewery and buildings seem to fill a huge part of Dublin. Every over building has a Guinness logo on it – be it offices or brewery. Or staff medical centre. Just walking to the Guinness Storehouse – the visitor attraction which celebrates the drink that symbolises Ireland to many – takes you past what feels like endless gates, walls, buildings, pipes, lorries and tankers. The Storehouse building itself was built in 1904 in order to house the beer fermentation process, and continued to do so until 1988. 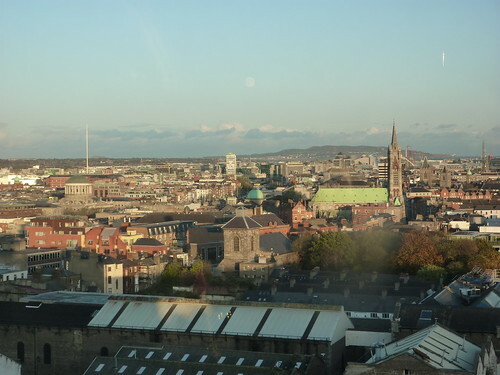 After being unused for years, it was converted into a visitor attraction, and now features a giant “pint glass” in the middle, which rises seven stories and towers over Dublin. 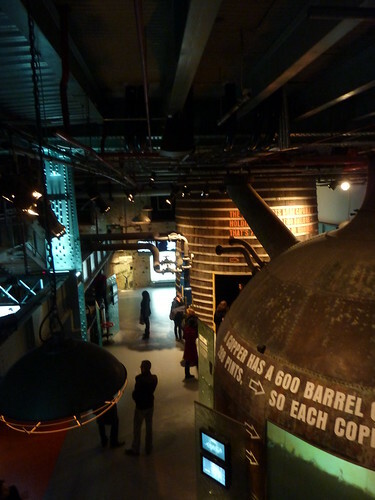 The Storehouse isn’t a brewery tour – it’s more a a museum to Guinness. And it’s big. Visiting on a cold November Sunday afternoon, it was busy yet barely meeting its capacity. The first thing you’re shown is a replica of the lease for the first part of the brewery – famously signed for £45 for 9,000 years – encased in glass in the floor. A tour guide gets things going, telling you some of the history, before setting you off on your own – the rest of the tour is self guiding. Naturally the brewing process is dealt with in great detail, starting with the ingredients – water, hops, barley and yeast – before you’re taken on a video tour of the brewing process, featuring one of the master brewers. Gleaming coppers and tanks are amongst the old brewery equipment (some from the former Park Royal Brewery in London) placed in situ to give you an idea of the history of it all, whilst the video screens show the modern process. You’re guided through each of the steps, and even invited to taste the roasted barley that helps give Guinness its dark colour (it’s actually dark red, not black.) A handful of visitors even get a chance to press the button which starts another batch brewing. You may be surprised to hear that I wasn’t one of them. After you’ve learnt the process, you might be a bit thirsty. You’d like a drink. Well it’s time to actually taste the beer – and by taste, they really do mean taste. Another video tells you how to release the aroma; how to discover the flavours properly. Tasting is different to drinking – once you learn how to taste drinks, your beverage choice may be changed forever. Or may not be. You decide. As well as trains, there’s boats. 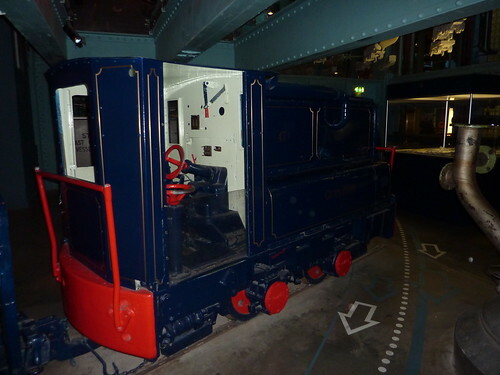 Guinness once owned its own fleet in order to transport its beer across the globe. And you can look at them too. Well models of them anyway. It’s not so long ago that beer was delivered in wooden casks. A few breweries still retain a cooper – Theakstons spring to mind – however like most breweries, Guinness now use metal kegs. 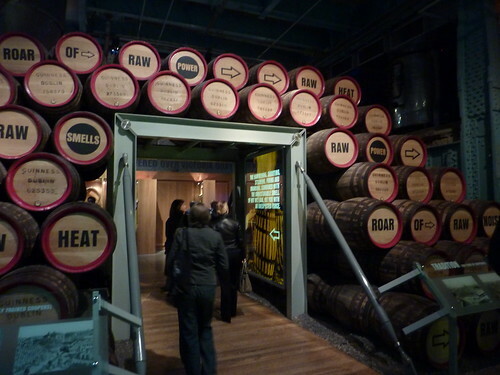 However in the days when Guinness did use wood casks, their coopering department was huge. Coopering could easily have been a rather boring section of the tour, however in Guinness land, it’s far from it. TV screens encased in wooden casks show a video filmed before the coopering department before it closed. It’s a engaging bit of film, showing the skill of the cooper, and process of how they make a barrel. Leaving the first floor behind we entered the marketing men’s dream – advertising. Guinness has been well known for its marketing over the years, from the Gilroy adverts through to Rutger Hauer, and the epics we see today. 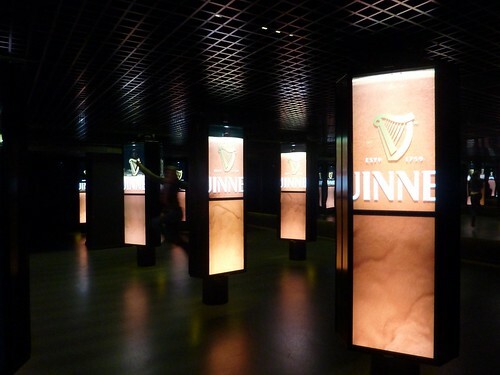 Guinness branding and marketing is so popular that people collect it all over the globe, and it lends itself naturally to such an exhibition. Dotted around the displays of posters, bottles, glasses and other things are TV screens allowing you to relive Guinness adverts from around the globe. It’s perhaps fair to say that the further you go into the giant pint glass, the less engaging the exhibits seem to be. A prime example of that is on the third floor in the “Choices Zone” which is supposed to extol the virtues of drinking Guinness responsibly however seems ultimately like a box ticking exercise designed to say “look, we’re not telling people to get drunk all the time”. It’s most video screen based, sat next to an empty room full of quotes on the wall like “there’s always time for one more!” which seems to contradict the whole point of the thing anyway. Upstairs on the forth floor, things are a little better with the story of the Guinness Storehouse, which is a steel framed structure of the Chicago School. However this is coupled with the “Home Zone” where you can leave a message about anything you wish on a giant noticeboard… No, I’m not sure why you’d want to either. Up again on the fifth floor, you can learn how to pour your own pint of Guinness, which few people seemed to be bothered about doing. Catherine didn’t seem keen either, even though you got a certificate! As someone who used to work behind a bar, I’ve poured many a pint of Guinness myself so it wasn’t that an exciting an option. The floor was shared with an exhibition dedicated to John Gilroy who was responsible for some of the most iconic advertising ever from Guinness’s history. You know… the toucan and the “My Goodness! My Guinness!” strap line… All very well and interesting except that the video projectors clearly needed new bulbs and better speakers, so the video was really hard to watch. Floor five also contained two bars, however it was up two floors for us before that, as we headed to the Gravity Bar for a complimentary pint of Guinness and one of the best views in Dublin. Being a complimentary bar, if you want more Guinness you have to go elsewhere, however that elsewhere isn’t necessarily far – we just needed to go downstairs to the Source Bar. The maps proclaimed this is where you could try other Guinness variants, which had me hoping for something exotic like Nigerian Guinness. Slightly unfortunately we found by Guinness variants, they actually meant normal Guinness on draft, bottles of Extra Stout and Foreign Extra Stout, and various other non-Guinness products. And no, not a single pint of Guinness Extra Cold to be seen – it seems it’s only the British who are daft enough to drink that stuff. 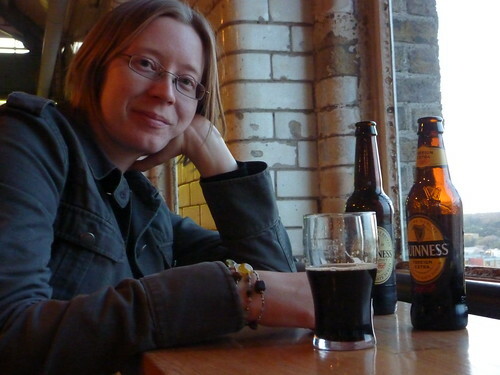 Opting for a bottled Guinness taste test, we went for the Extra Stout and the Foreign Extra Stout, settling down next to the white tiled walls for another view of the city. After dutifully tasting, we decided the Foreign Extra Stout really was the clear runaway winner.